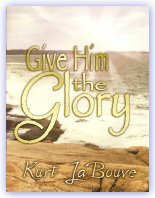 Evangelist Kurt LaBouve was born in a Catholic home and soon after losing his sight to a hereditary disease, he left home to attend a school for the blind. At the age of 18 he accepted Jesus Christ by faith as his personal Saviour. In 1982 he recorded his first gospel song "I Just Want To Thank You Jesus" in Nashville. Three years later, being heavily burdened to be used of God, he wrote a song entitled "Send Me" not realizing that in just a few weeks God would call him to preach the gospel of Jesus Christ. Kurt LaBouve has been serving the Lord with his wife Dale since 1988 as a Baptist preacher in evangelism, songwriting, & singing for the glory of God. All items below are available for the donation amount listed. There are no additional shipping or handling fees. Pick any 3 CD's for a donation of $40.00! 30 second samples can be played by clicking the play button. Moving the mouse off of the button will cause the song to stop. NOTE: The audio samples below are of much lower sound quality than on the CD's. If donating via PayPal, be sure to name the 3 CD's you want in the designated field. item(s) (CD/Book) requested along with your Name, Shipping Address, & Phone number. Thank you! © 2006 KurtLaBouve.com - All Rights Reserved.